Some of the students who protested the ‘dismissal’ of their teachers at Kian Kok Middle School on Friday. 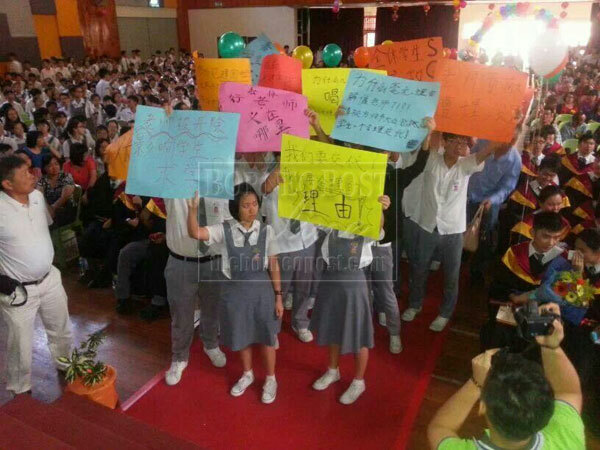 KOTA KINABALU: About 30 students from Kian Kok Middle School staged a protest during the school graduation day on Friday against the sacking of 10 teachers. Holding banners written in Chinese “Justice for our teachers”, they chanted “against the teachers” termination. The students dispersed after the school management called the police to calm down the situation. Videos and posts regarding the issue have gone viral on the social media since Friday, which drew negative reactions from the public. However, some were not against the decision of school since it is normal for a private company not to renew employees’ contract due to certain reasons. Both the school management and the sacked teachers had not made any press statements as at 4pm yesterday. The school management is expected to issue press release by Monday to explain the real situation and the termination of the teachers’ services. State Education Exco Datuk Masidi Manjun when asked about the incident on Facebook replied that teachers who were employed by the Board of Management of Kian Kok Middle School are bound by the terms of their employment. He admitted that he did not have any details of the issue, so it is unfair to make further comments. “There are two types of teachers in independent or government aided Chinese schools – government teachers and teachers employed directly by the school. If they are government teachers assigned to Kian Kok it is not possible to just fire them without going through the normal procedures. “It’s not easy to terminate the services of government teachers, more so if they are already on permanent and pensionable status. “However, if they are employed by the Board of Management of Kian Kok, then they are bound by the terms of their employment,” he said. Masidi, who also Minister of Tourism, Culture and Environment, added that the Management Board of Independent Chinese schools has the full power to determine the policies of the school including staff recruitment and students enrollment.